Garden of Earthly Delights ” is the latest exhibition at Flux to showcase the work of Bristol artists Louise Blois and Judy Rodrigues, both inspired by elements of nature and their transience. Ceramic artist Louis Blois is has an enduring fascination for the natural world and how to capture it creatively. After studying ceramics at Camberwell School of Art Louise completed her masters degree Cardiff. Louise creates sculptural lighting, tiles and hand built vessels that portray the transience of a flower's bloom but give it a permanence. Working with paper porcelain clay, she encapsulates the essence of botanical elements through her use of impressing and press-moulding with plaster blocks. This technique helps to explore the potential luminosity, translucency and delicate nature of Porcelain. Louise’s glazes highlight the natural form of the flowers. The transforming effect of light through translucent porcelain makes the subtle details more apparent and creates a beautiful 'atmosphere' that transcends the objects to both functional items and works of art. Judy Rodrigues is based at Spike Island. Her paintings, journals and studies draw from nature in both direct and metaphorical contexts, with research areas in the poetics of environment and diaspora. Her childhood on the Isle of Wight first inspired her to work from the elemental landscape and world around her as a free, direct and natural way of open learning & enquiry. Judy is interested in the bringing to life of painting - and its ecological conditions, as a mark and/or form of individual, collective, timeless and a communicable production. Judy’s paintings evolve in connection to places that generate intuitive associations and responses. The larger canvases suggest their form through a process of continual application, erasure, excavation and layering. All works on show are for sale. A selection of works will be available to purchase online following the preview. 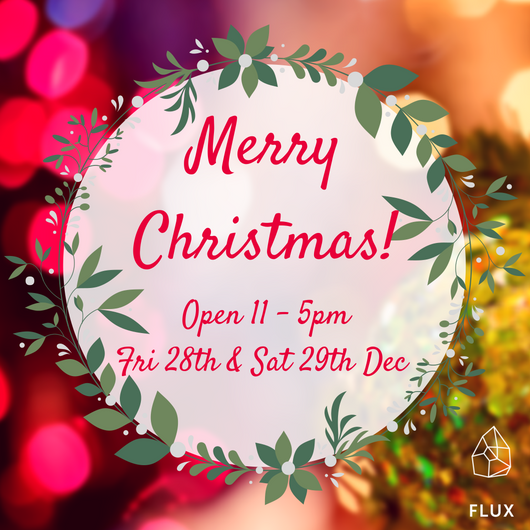 Flux has now closed it's doors for Christmas. We will re-open at 11am until 5pm on Friday 28th & Saturday 29th then close for New Year until 11am on Friday 5th January. Purchases from our online shop over Christmas will be handled on 28th & 29th Dec. Purchases from our online shop over New Year will be despatched when we reopen on Friday 5th January 2018. Thanks to each and every one of our wonderful makers, customers, students and neighbours. We wish you all a very merry Christmas and a fabulous New Year! Come and enjoy a spot of Christmas shopping and support our uniquely independent designer makers at the same time! Join us from 5.30pm onwards this Thursday evening as the Christmas lights throughout Christmas Steps Arts Quarter, our wondrously unique neighbourhood, are switched on. Many of the shops and businesses will be open later than usual, including our marvellous neighbours Stafford Townsend, Makers, Blaze, I am Acrylic, Weber & Tring & 20th Century Flicks. There'll be some special offers and live music on the Christmas Steps. Come along and meet artist Angie Kenber whose exhibition of wonderfully vibrant abstract paintings are currently on show. Angie Kenber is a Bristol-based professional abstract painter, working in bold and expressive colour. Her beautiful jewel-coloured abstract paintings evoke feelings of joy and freedom. Angie paints on canvas and wooden furniture, and her work is printed onto luxurious cushions and high quality coasters.